"Annise Danette Parker was elected mayor of Houston on Saturday, winning her seventh consecutive city election and becoming both the first contender in a generation to defeat the hand-picked candidate of Houston's business establishment and the first openly gay person to lead a major U.S. city." 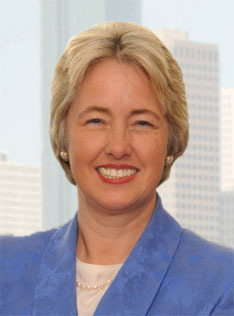 Bradley Olson, "Annise Parker elected Houston's next mayor", Houston Chronicle, 13 December 2009.